This work is a collaboration between an algorithm and myself; multiple images and perspectives of the same subject are taken and fed into an algorithm originally designed to merge images of landscapes into a single panoramic image. The act of introducing a body to this process results in a confused and often glitched reality: failed attempts to read the body as landscape and disassociate from the portrait, results in inconsistent and at times merciless reconstructions. Venus, printed in their negatives, references the tradition of photography itself. Negatives develop and expose an image, while these images impose themselves onto their surroundings, transparent and influenced by what lies behind. They depict the multiplicity otherwise lost in my singular and captured gaze. In doing so, I switch places with technology. The algorithm gains autonomy over the image, and I become its apparatus. I am examining the root of image making, at its most fundamental, questioning our vision. Flowers triptych, a study of Vincent Van Gogh’s Sunflowers, examines the photography at its most primary, stripped down into red, yellow and blue, positive and negative. It offers a surreal hyperrealism, in which we refine each singular element, before beginning its reconstruction. Technology translates digital information into a new visual field. It has become digital in its rendering: a visual binary translated into three-dimension. Whispering to Venus (Self-portrait as Venus) utilizes a mobile 3D scanner to capture myself posing as Venus, after Botticelli’s iconic painting The Birth of Venus. 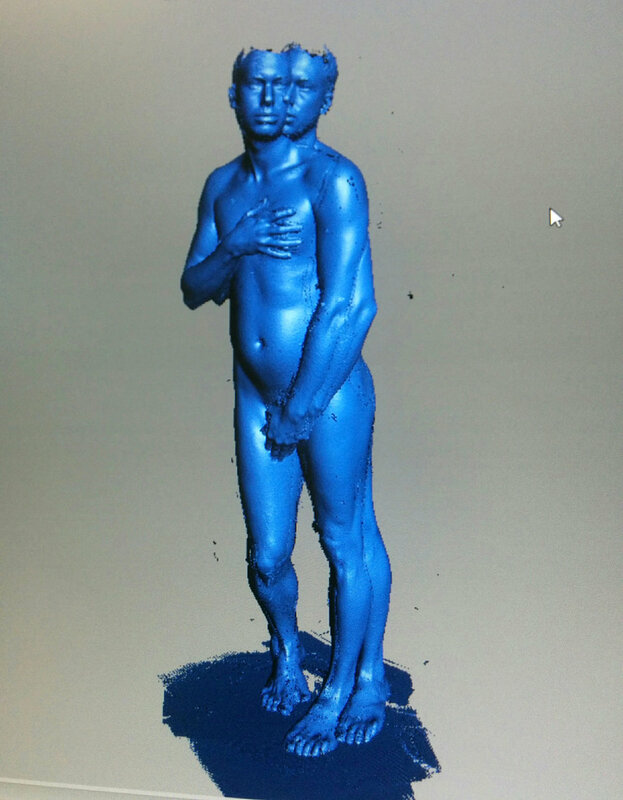 This information was fed into another algorithm and used to reconstruct the image as a sculpture, 3-D printed in a polymer dust that references the traditional Ancient Greek sculptures. The image glitched and fractured. The apparatus point of view is inorganic and ruthless in the process of mechanical assembly. The countless angles were not always resolved and thus created extra limbs. I emerge from myself, appearing to whisper, caught in these perspectives, in the process of creation. 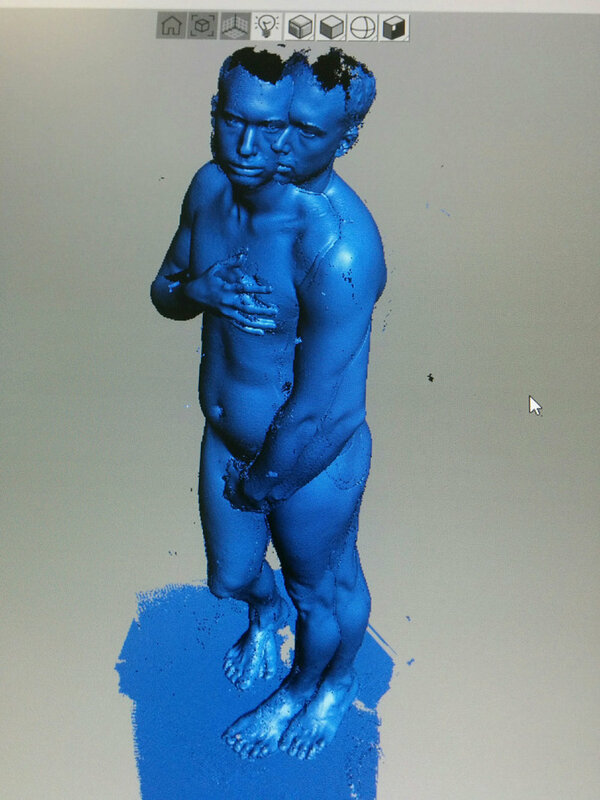 Initially I took countless 3D scans of myself posing as Venus from Botticelli’s iconic painting “The Birth of Venus” from multiple angles using a mobile 3D scanner. An algorithm fuses all the images. The result is a self-portrait as Venus which although a synthesis of multiple images produces a sculpture which at first might appear integrated but is actually incomplete & glitched.